The core of this code is that there are two types of classes, OptionGroup and classes that derive from Option. 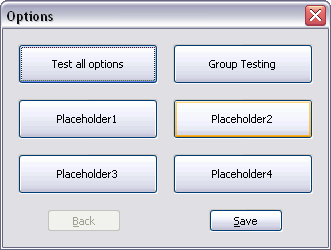 Option groups are used to setup menus that can be traversed in the dialog. Each OptionGroup can either contain a set of option groups (which will be used to define a menu), or a set of options that will be used to define a set of options to be displayed. As you can see, its pretty trivial. The constructor saves information needed to display the option. Display() is called when its time to display the option, and you just add the controls to a grid sizer that has two columns in it. Whenever your option is going to be destroyed, then OnWindowDestroy() is called. Save() saves the data to a wxConfigBase class, and Enable() enables/disables the controls when needed. This is GPL licensed code, and you can download the source code as always from my software page. There is also a Windows executable that you can download (available in a separate package) if you don’t want to compile the code yourself. The code is designed to work on wxWidgets 2.6+ (haven’t fully tested 2.6 yet, however). I built this with Visual Studio 2005 and wxWidgets 2.8.7, and there is a VS 2005 project included, but your mileage may vary with that. This entry was posted on Tuesday, April 29th, 2008 at 3:22 am	and is filed under Carputer, Software, wxWidgets. You can follow any responses to this entry through the RSS 2.0 feed. You can skip to the end and leave a response. Pinging is currently not allowed.